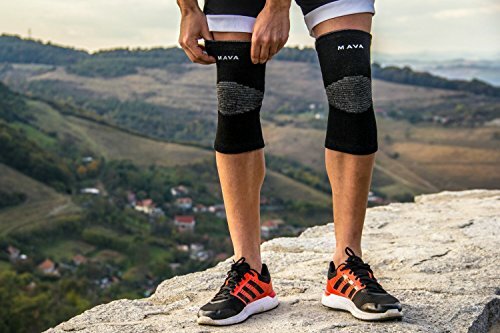 Mava Sports is proud to bring you the very best Knee Support Sleeves on the market! They were carefully designed to solve all your past frustrations, to keep you comfortable and healthy. Improve your performance in all types of physical activities! Who were these Knee Sleeves made for? -Men and Women who want better knee support, compression and safety. 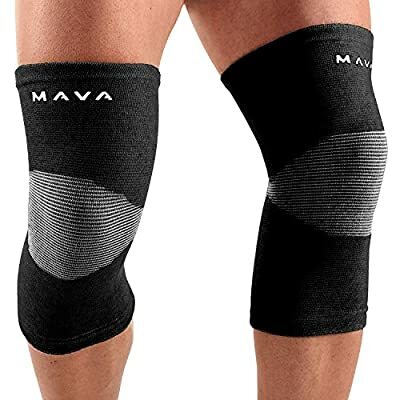 Comfortable: Good knee support with no stiffness. No itching. No slipping. Full mobility & comfort. Anatomically shaped: Prevent injuries and accelerate your recovery. Great for healing and rehab. Pain relief from: osteoporosis, post-surgery pain, swelling as well as strains and sprains. Wear Everyday: Easy to wear thanks to its light and soft material. Unisex. Can be worn all day. Perfect for cross training, weight lifting, gym workouts and any other types of exercises MATERIAL COMPOSITION: bamboo charcoal fiber, spandex and latex.